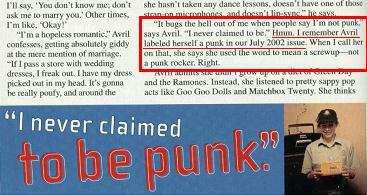 As you may have read in the Why 'H8' We Her section, Avril contradicts herself. A lot. This section is just to prove to you that Avril needs to try and remember what she lies about so that she doesn't contradict herself. "According to the Matrix, they wrote the bulk of the three hit singles by themselves, following their first meeting with Lavigne. "With those songs, we conceived the ideas on guitar and piano," says Christy. "Avril would come in and sing a few melodies, change a word here or there. She came up with a couple of things in 'Complicated,' like, instead of 'Take off your stupid clothes,' she wanted it to say 'preppy clothes.'" So, not only did Avril lie about writing all her own songs, but she actually changed them so that they catagorize 'preps' and 'punks'. How lame is that? Also, on the inside cover of Avril's debut album, Let Go, you can see that next to each song it says 'Written by Avril Lavigne & -----'. Not a single song on the album was written completely by her. Avril has said many times that she is a "free spirit" and that no one can tell her what to do. I have heard numerous times that at some of Avril's concerts, she gets the fans to chant "Pepsi! Pepsi!" over and over. Isn't that odd? Why would a free spirit do that? Is it because Avril is endorced by Pepsi Cola and this is just an advertising ploy? Of course not! 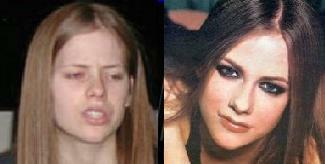 Avril is a free spirit, remember? No one can tell her what to do. She was just making her fans scream the name of the company that sponsers her for fun. Yeah, right. UPDATE! Avril is now a part of the Pepsi Smash tour!!! How t0talLi h^rdc0r3!!! Usually 'singers' don't sell out until at least their third year in the buissiness. I guess Avirl is just THAT advanced.